"Fresh local coffee, delivered by people with passion for our industry and life in general." Moja Coffee is a North Vancouver coffee roaster and cafe based in a light industrial node near the Second Narrows Bridge. Walking into the cafe you will find that it's fairly utilitarian in design with a coffee bar placed in the center of the space surrounded by a few tables. The back wall is covered in large grey tiles with a large window framed in stainless steel that looks back into the roastery. 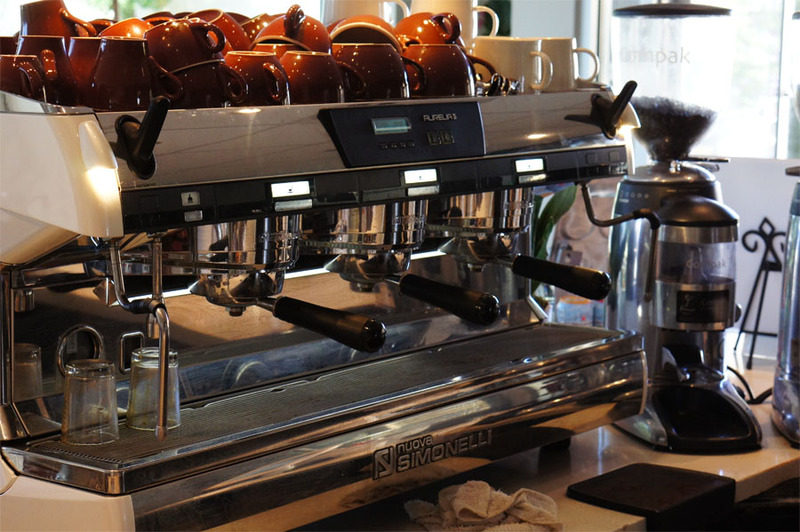 The cafe serves drip coffee, French press service and espresso drinks from their Nuova Simonelli machine. They also serve a variety of loose leaf teas from Ariel Tea. 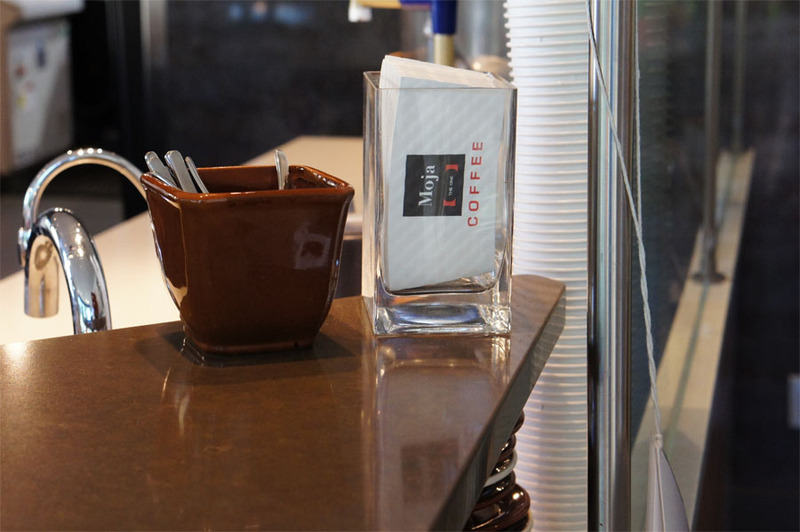 Moja has a unique relationship with Thomas Haas Chocolate providing his two cafes with a espresso beans. In return Moja stocks a selection of croissants, scones and other viennoiserie from Thomas Haas that get baked onsite. They also carry some gluten free baked goods from Wendels True Foods based in Fort Langley. Moja Coffee opened in 2004. They relocated to their current space in 2008. While the area has mostly transformed into shopping malls, North Vancouver's Lynnmour South used to be the home to a distillery and Kodak film production facility until the 1980s. The Park & Tilford shopping mall and North Shore Studios was once the site of the Park and Tilford Distilleries that opened in 1957. The 3 acre botanical garden located next to the mall was a gift from the distillery to the community. The Kodak lab on Keith Road opened a few years later in 1961 and handled Kodachrome and Ektachrome film processing. While Kodak Canada's operations based in Mount Dennis, Ontario lasted until 2005 when the factory there closed. 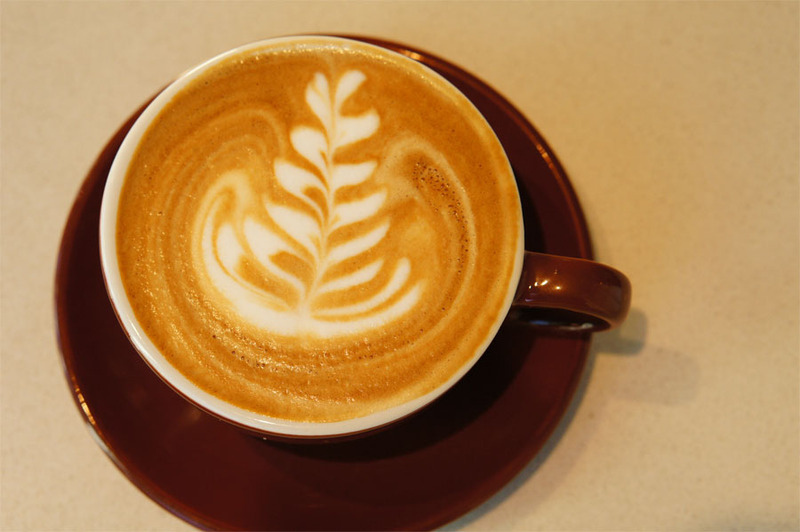 The cafe has a "happy hour" every day offering 50% off espressos, macchiatos, cappuccinos between 1-3 PM. Moja Coffee supplies a number of businesses around Vancouver including Yew Restaurant + Bar in the Four Seasons Hotel, Thomas Haas, Terra Breads and the Vancouver Convention Centre. Located on the corner of Rupert Street and Harbour Avenue near the Canadian Tire. "Moja Coffee’s old roaster has been preparing beans since the company opened a decade ago. The “workhorse” of roasters, it now sits at the back of the North Vancouver café beside a towering, shiny new machine imported direct from Portugal."